As you plan for your retirement, don't expect Social Security alone to keep you afloat. Give dividend-paying stocks serious consideration, as they can be a great support in retirement. Image by TBIT via pixabay. With interest rates near record lows, many retirees have been forced into the stock market as a way to generate income. While that can be a savvy move, it's incredibly important for those investors to only put their money to work in high-quality companies that offer reliable payouts. To help assist these retirees in their searches for companies that fit the bill, we asked three of our Motley Fool contributors to share a stock they they think offers up a dividend payment that can be relied upon for years to come. Read below to see which stocks they highlighted as smart choices. Todd Campbell: Investors looking for a healthy income stream in retirement need to focus on quality and consistency, but it doesn't hurt if that can come in the form of a market-beating dividend yield, too. For example, Pfizer (NYSE:PFE) boasts all three of those characteristics. First, its $50 billion in sales make it one of the biggest pharmaceutical companies in the world. As a result, it kicks off plenty of shareholder friendly cash flow that can keep dividend payments flowing. Second, the company has paid dividends to investors for 308 consecutive quarters. Third, the company's 4% dividend yield is significantly higher than the S&P 500 ETF's (NYSEMKT:SPY) 2.17% dividend yield. Granted, headwinds could materialize that hamper Pfizer's financials, but it's hard to imagine they'd be stronger than the ones facing the company after it lost patent protection on its best-selling medicine, Lipitor, back in 2011. Pfizer kept on paying its dividends in spite of a big drop-off in sales caused by Lipitor; therefore, it's likely Pfizer's commitment to paying its dividends on time won't end anytime soon. In fact, with the recent completion of its $17 billion deal to buy specialty- and biosimilar-drugmaker Hospira; plans to merge with Allergan in a $160 billion deal that swells its pipeline and offers billions in tax savings; and management guiding a return to top-line growth this year, I think Pfizer could be a great stock to own in income portfolios. Brian Feroldi: Any retiree who is looking to the stock market as a way to generate income should focus on finding companies with strong competitive advantages that offer up dividend payments that are well covered by the company's cash flow. One company that fits that description perfectly is the telecom giant Verizon (NYSE:VZ), which is why I think it's a great choice for investors in their golden years. Verizon's competitive advantage stems from its huge stateside market share, as it currently controls more than 30% of the wireless phone market. Verizon's huge size and scale makes it tough for any would-be competitor to try and wrestle away market share as it's difficult and hugely expensive to maintain and constantly upgrade a nationwide network. Verizon is one of only a few companies that has the financial strength to do so, which should help it maintain an edge for years to come. Another nice benefit of investing in Verizon is that its business has become recession resistant, as many Americans are hopelessly addicted to their phones. That should help to ensure that cash will continue to flow into Verizon's bank account if the U.S. economy takes a turn for the worse. Verizon currently offers up a generously dividend yield of 4.5%, and its payout is well protected as the dividend consumes less than half of the company's annual cash flow. That gives the company plenty of financial flexibility to continue to make payments in good times and in bad, and should ensure that its dividend will continue to slowly rise over time. Sean Williams: The best retirement portfolios are usually built on a foundation of great dividend stocks. One such dividend stock that you can consider adding to your retirement account right now which should deliver substantial income is healthcare-based real estate investment trust HCP (NYSE:HCP). HCP's focus is acquiring and leasing properties involved in healthcare, such as hospitals, life science buildings, medical offices, hospitals, and skilled nursing facilities. The reason a portfolio of healthcare real-estate assets is so intriguing relates to improving access to medical care in the U.S., as well as growing life expectancies. The implementation of the Affordable Care Act, also known as Obamacare, has pushed the uninsured rate to the lowest level in recorded history, meaning hospitals, medical offices, and life-science companies are highly incentivized to reach these newly insured consumers. This is being compounded with historically low lending rates that are allowing businesses to expand for a minimal cost, while also giving HCP an opportunity to expand its portfolio at an exceptionally low lending rate. Finally, rising life expectancies for Americans means an extended period of time where care facilities will be in demand. In addition, HCP is the only REIT currently among an elite group of dividend-paying companies known as Dividend Aristocrats. There are a little more than four dozen companies that are Dividend Aristocrats -- companies that have raised their dividend for a minimum of 25 straight years -- and HCP has boosted its annual payout in each of the past 31 years. 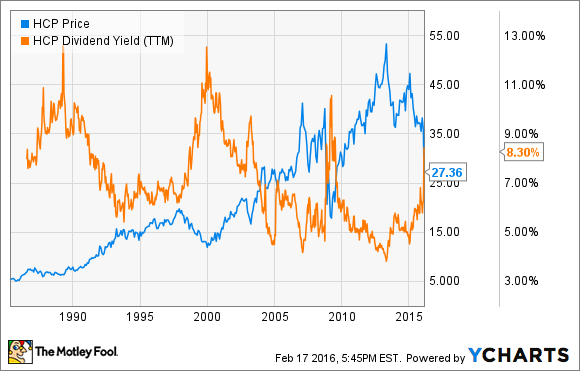 HCP is currently yielding about 8% -- that's more than three times the current yield of the S&P 500. And, as you can see from the past 30 years, HCP very commonly yields 6% or higher.